What kind of projects could I or my group pursue? An excellent online repository for First World War projects is provided by Historypin. 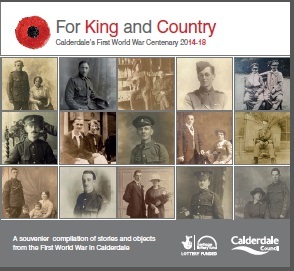 An example of a recent First World War project is 'For King and Country: Calderdale's First World War Centenary'. This HLF-funded project organised an exhibition and events commemorating the Calderdale region's wartime contribution and experiences. See how the project used Historypin as an online archive of First World War images. Copies of a souvenir guide accompanying the exhibition can be purchased from Bankfield Museum or ordered from museums@calderdale.gov.uk. Crowd-sourcing Projects - Two major crowd-sourcing projects have been established to mark the First World War centenary. Led by the Imperial War Museum, Lives of the First World War gathers information about individuals who were involved in the conflict as civilians and military personnel. Operation War Diary allows people to explore war unit diaries digitised by the National Archives. Step by step guidance is provided for both projects and they are particularly good for use in schools or small groups. The Council for British Archaeology is working with Historic England and partners across the UK to help local communities identify and map the remains of the First World War in Britain. Local people can help to document and preserve our stories, and vulnerable remains, for future generations. Running from 2014–2018, the Home Front Legacy project is supporting community groups researching local places associated with the Great War with an online toolkit and guidance for recording the remains of surviving sites, structures and buildings around Britain. Find out more on the Home Front Legacy website.